My father bought this in August, used it around 6 times before his condition worsened and he died in December. 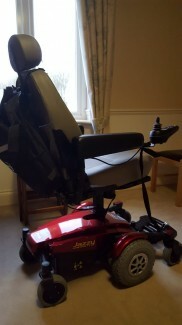 The Pride Mobility Jazzy Select 6 is a highly manoeuvrable and nippy chair, delivering increased efficiency, torque, range and performance with maximum front stability. Comfort is also assured with its high-back reclining seat, with flip up adjustable armrests, headrest and lapbelt as standard. The Active-Trac Suspension also contributes to a smooth and enjoyable ride as does the mid wheel drive which offers a tighter turning circle. The Jazzy Select 6 also features easy access side batteries, charger port and circuit breaker for trouble free maintenance. 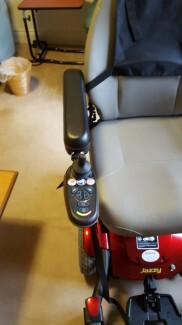 This particular model includes a 4″ seat riser and VR2 controls as standard.